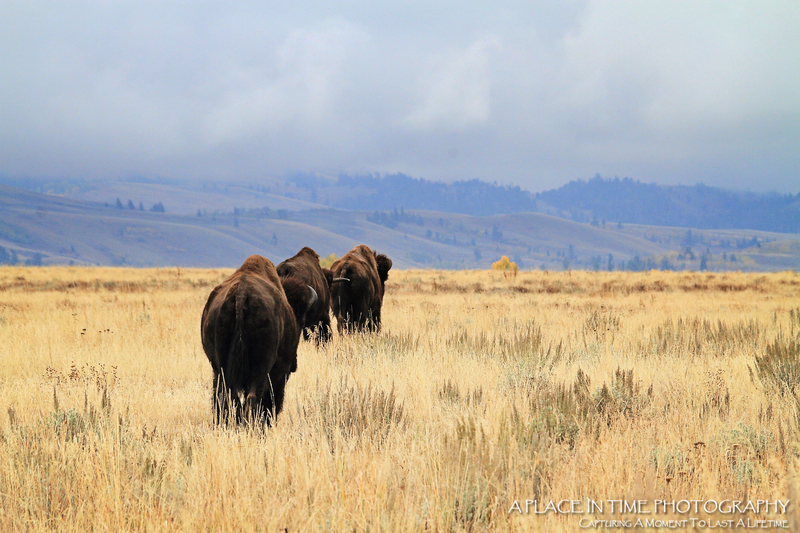 APlaceInTimePhotos | Travel, Conservation, Animal Welfare and stories of an all around great island life. 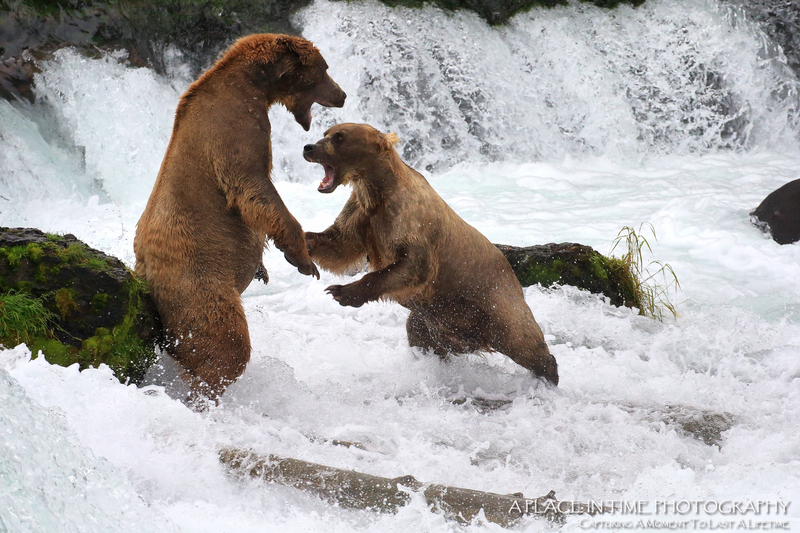 On a recent trip to Alaska’s Katmai National Park the opportunities for brown bear observation and intimate encounters was truly epic. 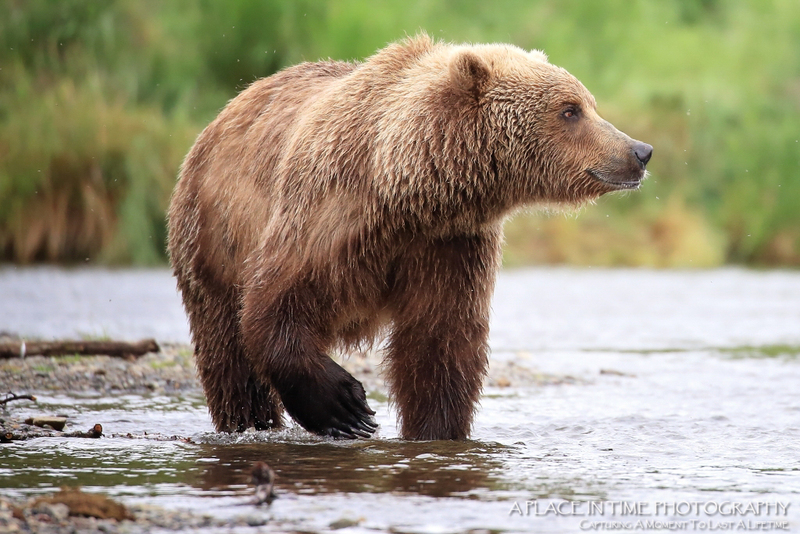 There was a bountiful run of salmon throughout the summer season combined with low water levels allowing the bears easier access to fish spawning in the lakes and streams. The weather compared to the previous year was generally pretty dry for southern Alaska and provided long daylight hours combined with overcast skies which made for beautiful photography for hours on end. 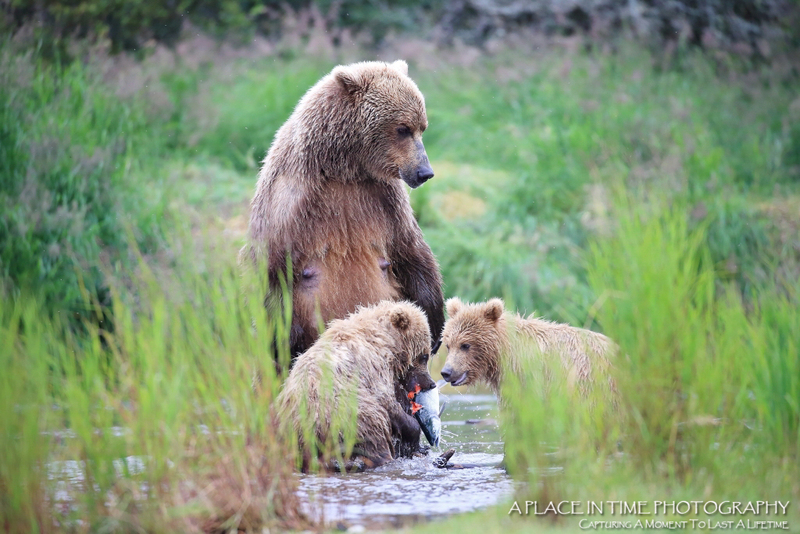 This particular morning I was up before sunrise with a small group of friends and we headed down to the beach alongside Naknek Lake to photograph two mothers and their cubs of the year as they slept in shallow little beds dug in the sand. These adorable little families gradually woke up stretching, nursing and play fighting to start off nearly every day. After the sun rose and the bears headed further down the long, narrow beach to spend some alone time in the shelter of the forest we took our cue as well heading across to the river in chest high waders to make our way up towards the falls to shoot brown bears fishing, playing and interacting from eye level. There were 4 of us so we felt great about the whole “safety in numbers” thing. Despite that though it was still time consuming and more than a bit challenging to navigate our way through the marsh grasses and through the forest trails to a point where we could eventually hop into the water with our gear and cross over to a nice little island mid-river because of the dense numbers of bears in the area. 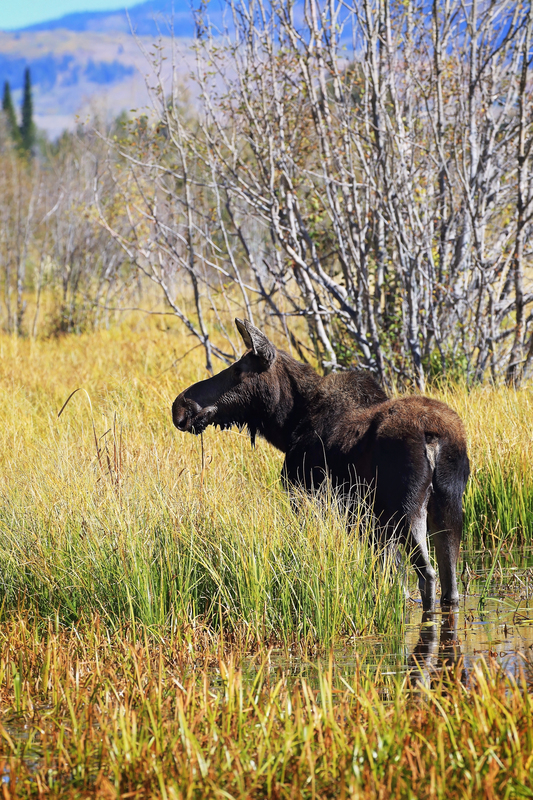 Not only were there large boars fishing and mothers with cubs, but this year there were a large number of sub-adults that were both extra curious and playful. 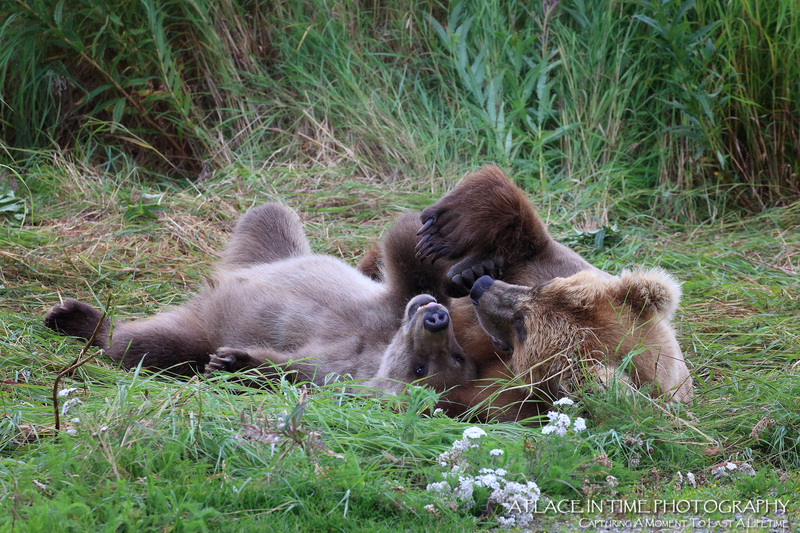 The naughty little teenagers of the bear world trying to test out their boundaries and newly found freedom. After we managed to dodge the fishing bears, the playing bears, the arguing bears and the sleeping bears we got about a third of the way into the river towards our target island when it was very clear that this large mother and her twin cubs were headed from the opposite bank to the same place we were. The island is fairly small, I’m guessing 50 feet long by 20 feet wide so it wasn’t ideal trying to negotiate a “stay-cation” for all of us on it at once. However changing direction and heading any other way lead us into deeper waters and much swifter currents so straight ahead to the island we went. The following series of images were taken at a focal length of approximately 100mm while this gorgous mother fished for salmon in the shallows and her two small spunky cubs stayed in the grass. 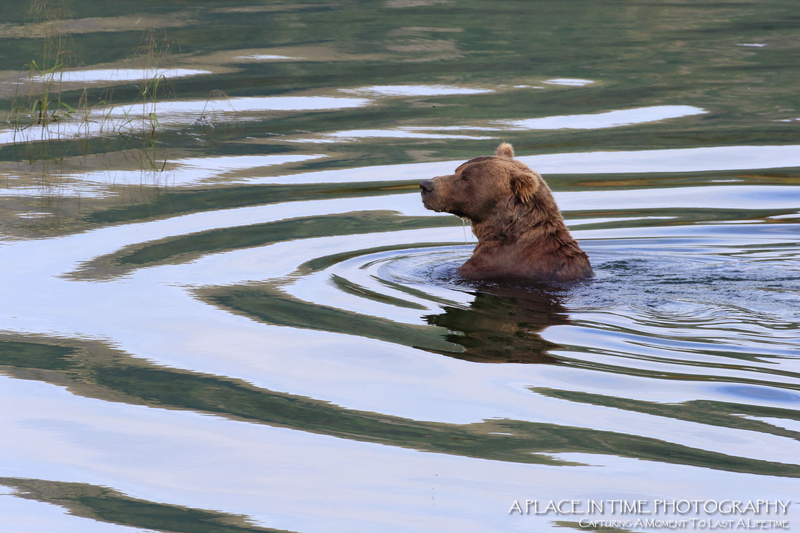 She was exceptionally tolerant of our presence and we all felt comfortable enough to just kneel down in the water to a sitting position at the base of the island while the bears stayed about ¾ of the way to the opposite side. The little cubs of course were very curious what we were doing and would peek out from the grass like they were playing hide and seek. 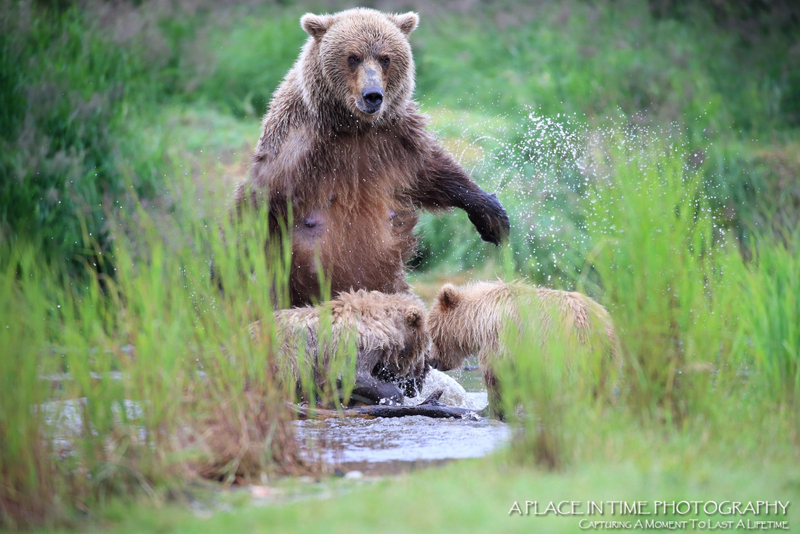 We spent a little over an hour with this trio enjoying every minute of it…. Except for maybe that 10 minutes when mom had absolutely had enough of her two kids squabbling over food and lunged upright to a full standing position, swatting the water with her paws, and roaring without question the loudest roar that I’ve ever personally heard from that close of a distance. 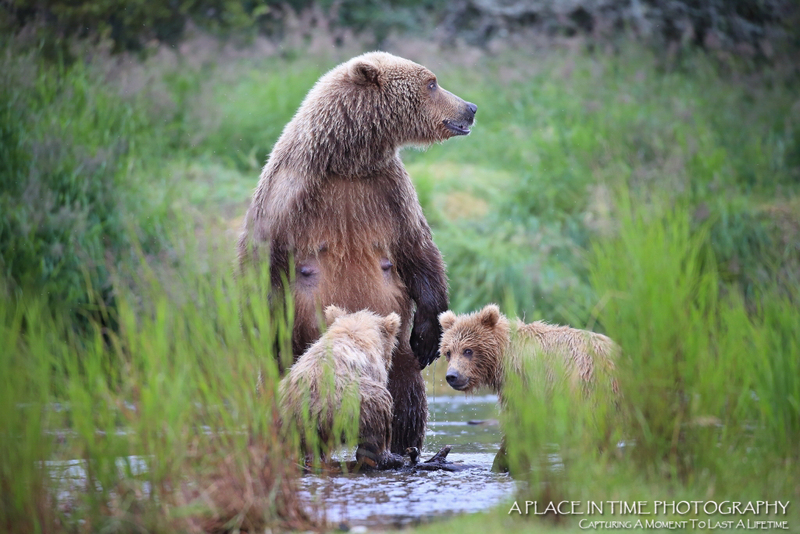 She towered over her cubs (and us) yelling and glaring while her kids instantly put an end to their bickering and settled for nibbling from the same salmon throwing a couple dirty looks each other’s way instead. Then larger cub took a quick glance back at us like, “did you see that?” Hard to tell if they were embarrassed we saw or seeking sympathy but their little expressions were quite comical. Bears have always topped my list of favorite animals for a variety of reasons. A lot of that having to do with my belief that they are very misunderstood by most of society. It’s easy to cast them in a negative light based on their size and power alone, but it’s hard to believe that anyone could still feel this way after spending any time with them. Their dexterity, sense of humor, animated expressions and love for their cubs is an absolute joy to witness. 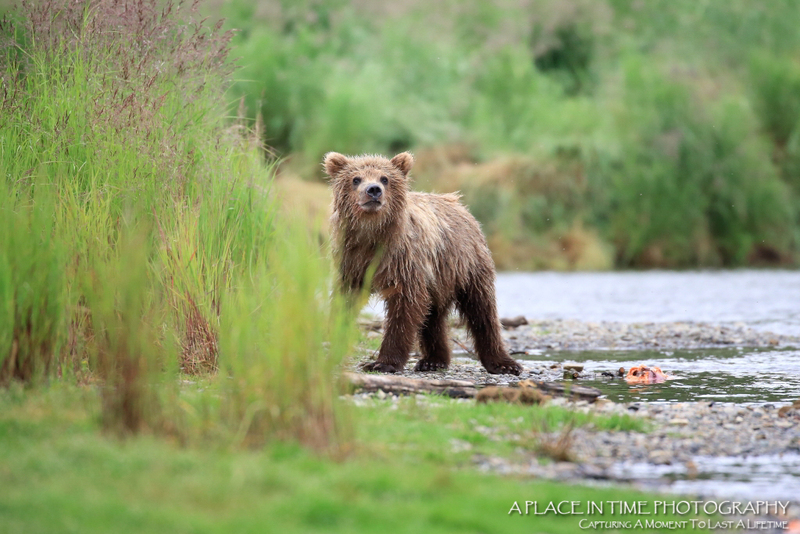 I sincerely hope that for everyone who doesn’t have the fortune to see it in person, will atleast be able to live vicariously and enjoy bears just a little bit more through my images. It’s always amazing to me how sometimes your initial assessment of a situation can in reality be the polar opposite. It didn’t take long after returning home from Southern Alaska before I realized that my relief at “disconnecting” from the world for a week was a total misconception. In reality it wasn’t a disconnect that I was enjoying so much as it was a total reconnect. Planning my trip to Alaska this summer was super exciting and also more than a bit nerve-wracking. I’ve never been completely off the grid before with absolutely no potential for connection with the outside world. No cell phone, no internet, no TV, no radio. Nothing. And I’ve never been to an area that remote while sleeping in a little tent with just the absolute necessities rather than every day luxury items you quickly grow accustomed to. Sure I’ve traveled to some out of the way locations, but even so, I have still managed a connection to friends, family and clients if needed given a little effort. This time, in this location, that simply wasn’t going to be an option. In hindsight, I see now that I’ve never taken an actual vacation from work before, which is completely ridiculous. Regardless of my location; if I’m in Asia or Africa or in a remote mountain cabin somewhere, I’m still diligent about responding to emails or voicemail, getting back to clients, and scheduling appointments for when I return. It never donned on me how even these little arbitrary interruptions sprinkled throughout the day prevented me from being completely present to whatever experience I was having. There was always a little part of me still at work, or still at home or still somewhere that wasn’t where I physically stood. 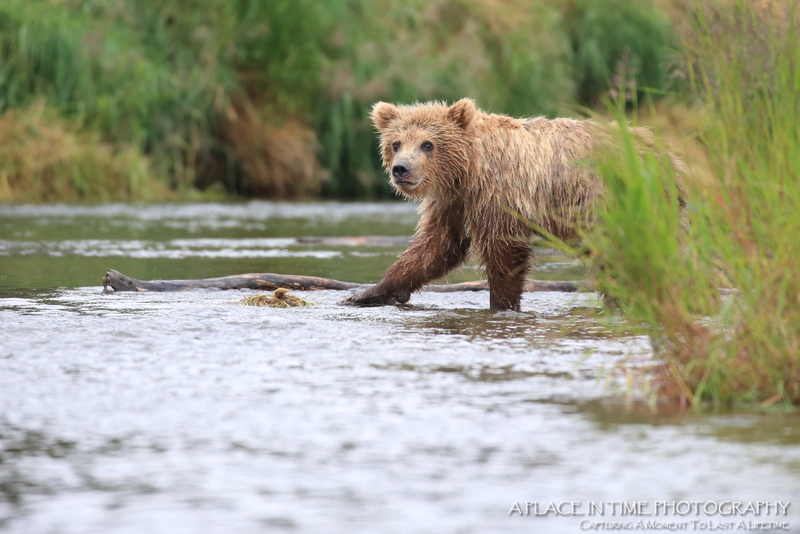 After spending a week in a tiny remote area of Katmai National Park (the most remote national park in the US) photographing brown bears returning back home to a my “real life” in a condensed island town, with what now seemed to be constant noise, electronic interruptions and mundane tasks was a less than amazing transition. I had a heck of a time figuring out why this time acclimating to life back home was so much more gut wrenching than most. Finally after stumbling across a fellow travelers narrative of their time in the wilderness it all clicked for me. This little getaway was so much more meaningful for me because I was forced to be completely present every minute of every day. Present to myself and my physical well-being and needs, the weather pattern around me, the animals and their patterns and schedules, and getting to know other like-minded people. How rare it is these days to be able to be that completely present in “real life” with all the phones going off, emails coming in, traffic, deadlines, expectations, and the list goes on. I was reminded why I began my pursuit of photography so many years ago. Loud and clear. It was because of my passion for the environment and all that entailed. To be able to capture it in the purest sense, and preserve the beauty I find in it – in all those remote nooks and crannies that others may initially overlook. The seemingly hidden macro elements of leaves, flowers, textures and of course all the amazingness that can be found in wildlife if people just have the patience to wait for it to unfold. I’ve naturally expanded the scope of my work to include elements of commercial photography and branched out to offer portrait photography as well. I believe this offers a way of helping people to preserve those special moments in their life as keepsakes and also allows me an opportunity to connect with more people along the way to share my adventures and my love of the outdoors and all that it entails. “Getting away from it all” clearly wasn’t what happened at all. I returned home with so much more focus and feeling like I’d found my center again. Given a chance to simply remove all the superfluous distractions just showed me the path I’d intended to follow all along. And luckily had the extra bonus of providing heaps of brown bear along the way to study and photograph and absolutely fall in love with even more than before. 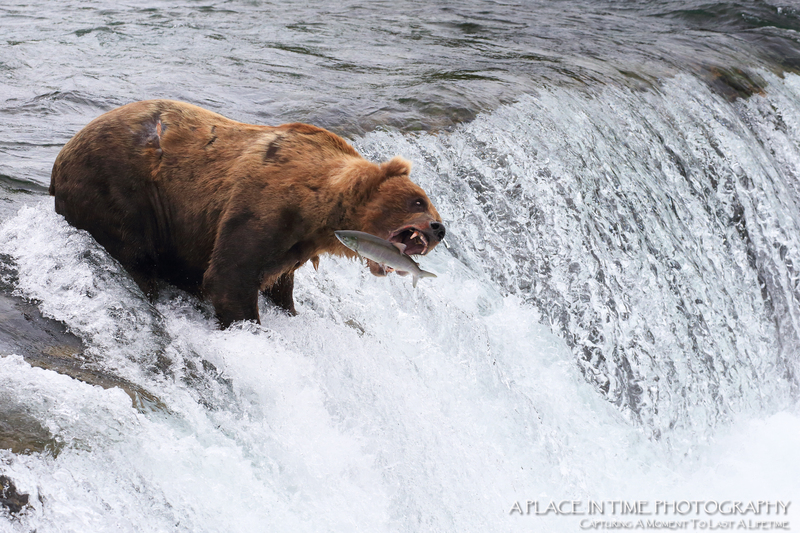 I think that the general body of work I was able to capture in Katmai is the best series of work I’ve ever compiled. And it was because I was able to give it my complete attention and focus. I could be completely present. I went into this trip with a shot list I’d gone over in my head a million times, and I was able to keep focused on those goals, and check off mentally where I was, and what I’d still like to achieve before heading home. There was no pressure, no stress “what if I don’t get this, what if I don’t get that, what if ….” That is so easy to fall into when you’re having to rush through a project or be pulled in different directions. Being there could be summed up as serene. It was easy to focus. It was easy to be grateful – every day. It was easy to appreciate all the little nuances unfolding around you with the bears, the cubs, the salmon, the chain of life. It’s something I hold dear, and hope to carry close to my heart and remind myself to apply now that I am back in the “real world” in the hopes my business will continue to grow and evolve and develop in the directions that I guide it. And in the hopes that my images will continue to capture the emotion of the moments in which they’re shot and bring people happiness in viewing them and watching the story that unfolded in front of the lens. After spending so much time on the water it’s become second nature to see things and feel things in an almost hyper sensitive state of awareness while I’m out there. I use a small Naish SUP board and conditions change quickly so not only are my eyes always peeled for wildlife, but I keep a lookout for wind shear approaching on the horizon and I monitor the surf reports for tides and expected change in wind patterns every day before going out. Paddling is like my own little personal meditation time and I get in a zone out there whether on top of the water, or when I duck underneath to take photographs. It’s relaxing and rewarding all at the same time when things go smoothly. I’ve been super lucky this summer that more often than not when I paddle out I can manage to find a few manta rays to follow around and swim with. They’re such cool creatures and it’s taken some time, but finally I’ve gotten pretty good about reading their patterns and judging how comfortable they are with me joining them in the water. Just like any animal, they all seem different and some are really social and others take off as soon as you get anywhere near them. 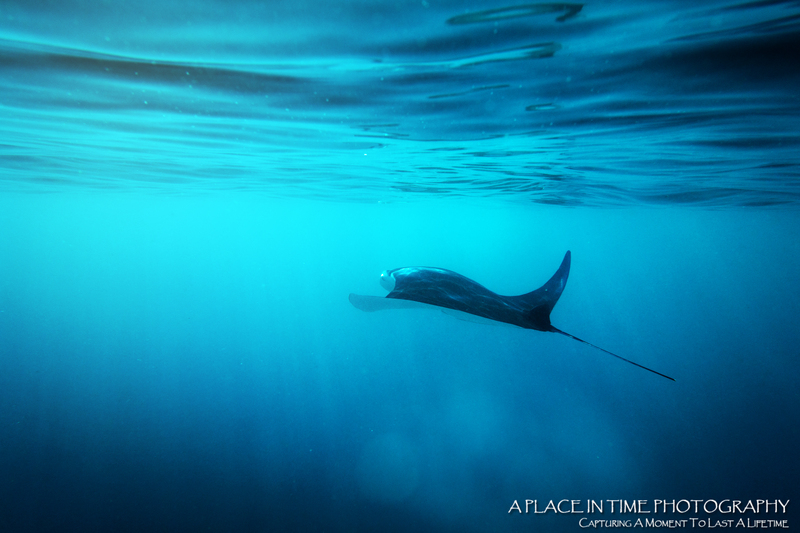 I’ve had rays jump out of the water in front of me, jump next to my board, fly around upside down in a kind of manta ballet and let me paddle within a foot or two above them while they calmly feed at the surface. The week this photo was taken I had a bit of a break in my work schedule so I was able to get out several days in a row and sure enough without fail, I found the rays within only a few minutes of being on the water. I was finding two or three within a pretty close proximity of eachother and they’d go about their business feeding and flying, sometimes to circle back and interact with eachother before flying off again. Mostly I’d swim and interact with one at a time, but every now and again one of its manta friends would come flying over to join in the activities and give me a once over before heading back off on its way. The visibility had been fairly good and I was actually surprised to find the mantas in such shallow water with the plankton levels seemingly low. But this day, the visibility was terrible. I mean absolutely awful. Both murky and filled with plankton and a few jellies. There were sunny skies which helped, but there was no way I would have gotten in the water had the mantas not been out and about as well as the honu. I have a little rule that if the turtles aren’t up I don’t go down. But with that said, it’s still undeniably the murkiest water I’ve jumped in for probably a couple of years. I spent an hour with this particular ray and several times when we were swimming near eachother I got a strong sense that I was being watched by something else. About the same time as my “spidey sense” would go off, the ray would bolt like a bat out of hell and then reappear 50 yards or so down the bay. Not that there aren’t other reasons for rays taking off like this, but the only time I have seen one do it consistently I looked down below me to find a huge tiger shark just floating there, probably 15 feet down, and directly underneath where I was swimming with my camera and where the manta had just been. I hopped immediately back on my board without incident but always remembered that as a good example to take my cues from the little critters who live in the ocean. If they go, I go. After about an hour in the murky water, I got that same strong feeling that I was being watched for the third time and I swam in a circle trying to see any shadows that would validate my feelings, but never could see anything as the sun went behind a bank of clouds. I decided then to call it a day and head in rather than taking any more chances and considered myself lucky to have had that good hour with the rays, even if they were behaving a bit more erratic than usual. No sooner had I gotten home than I got a message from a good friend who had paddled their canoe into the bay where I’d been maybe 10 minutes after I’d left – we just barely missed eachother. Not having any idea I had been there swimming with the rays, he wrote to tell me that as soon as he got to the center of the bay (and gave the exact coordinates where I’d been) he was approached by a very large dorsal fin as a shark followed along with his canoe and was checking him out. He said that he didn’t feel in danger per se, just like it was curious and watching him, which is the same feeling I was getting under there. Not necessarily in danger, but that something was there watching me. It was a very clear and timely reminder to me that in a world which often makes you doubt yourself and your instincts, they exist for a reason and time and again my instincts are right on point. With animals and people alike. Some of my fondest memories are those that came to be strictly by chance. Whether it be in everyday life walking down the street, spending time on the water, or traveling, I’ve had the very best of luck bumping into great people, finding great places and cool animals sometimes from good instincts but more often by a great twist of fate. Although I travel out west every year, I rarely go in the spring. Instead I try to time my trip to coincide with the bursting fall colors and thinning of crowds at the very end of the fall season. Last year I wanted to switch it up a little thought and flew in at the very start of the summer season instead. I was hoping to find some late season snow banks and hungry bears with cubs, but instead I found a whole bunch of sunshine and abnormally warm days so that the creatures seemed to be more fond of snoozing in the shade than coming out for photo session. On my second day in I drove south through the park as dawn was breaking to start a hike into one of my favorite lakes at the end of the Laurance Rockefeller Preserve trail. I arrived early enough that I even beat the rangers and there was only one other soul around who thankfully agreed to a hiking partner to make things a little more comfortable. As we trekked along talking of this and that, my newly found hiking buddy asked if I’d been to the fox den yet. I did a double take because I had no clue what he was talking about. He went on to explain that while here the past week on a training project for the Department of Forestry, he was taken to a fox den under an old abandoned cabin near an area of employee housing. I got really specific details and made sure I wasn’t going to be arrested for snooping around in an area designated for staff, finished that hike as quickly as humanly possible and hit the road in search of foxes. As luck would have it, finding the first den lead me to some tips about 2 other active dens in easy to access areas. Yay! 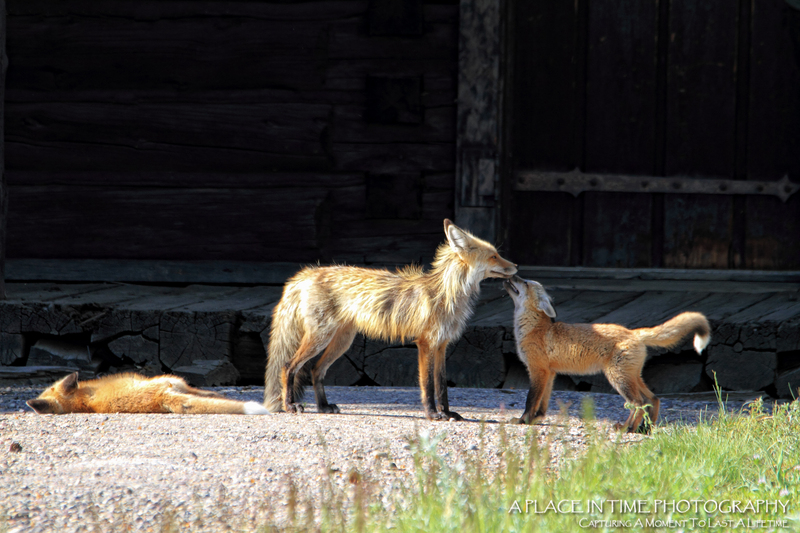 Only thing better than one fox den is THREE. So this photo was taken late one morning when mom had returned to the den and her kits of course were thrilled to see her, and have a nice ground squirrel bunch. She had 6 in all, and as rumor has it, they all survived through the season and grew into healthy, happy, independent little foxes. Never did I think I had the ability to sit for up to 12 hours a day at one specific site just waiting for cute things to come out and play, but never say never I learned as that’s what completely monopolized my complete vacation this past summer. I flew home after a total cuteness overload and had booked a return trip a couple months later by the time I ended my first layover. Couldn’t resist spending more time with good friends, and finding more fabulous wildlife to capture portraits of. Good people + good animals = good times. Just a little over a year ago I started another journey to Thailand to spend 2 weeks volunteering at a wildlife rescue and rehab facility south of Bangkok. After traveling twice to the Elephant Nature Park in Chiang Mai and being so impressed by not only the facility and the volunteer program, but by the founder Lek and her husband as well, I was extra excited to learn even more at another well-established facility. I did as much homework as possible before booking, and was extremely impressed at not only the quality of the informational packet this new facility provided, but also the response time to any questions that I had. Unlike most of my other trips, this time I coordinated with four friends from the US and Canada and we all met up in Bangkok to start our journey south. We were of varying levels when it came to animal rehab, volunteering, sanctuary life, etc. but were equally excited and couldn’t wait to get there and see the elephants and the myriad of other primates, bears and birds that we would be caring for. Although the informational packet we received prior to arrival was excellent, unfortunately it was neither accurate nor applied at this facility volunteer program. The information offered to volunteers about the animals in their care was minimal at best and often non-existent. We worked 11 hours per day with no zero feeling of appreciation from sanctuary owners. The center was basically run 90% by volunteers. Paid staff was few and far between. Volunteers were lead by other volunteers, not trained staff members so I found that a lot of facts presented as true about the elephants in particular were simply inaccurate (especially when it came to behavioral assessments). This is understandable considering that people were placed in charge of entire groups for a day after only being on-site a week. The elephants were being housed in small arenas sometimes smaller than a horse corral surrounded by electric fencing. Mahouts carried bull hooks for controlling the elephants and intimidating them both inside their corrals and beyond. It was made clear almost immediately upon arrival that the Elephant Nature Park was viewed as “the competition” and were not to be talked about while volunteering at this facility. The food volunteers were given to eat was covered in flies within moments of being put on the table and sometimes not even fully cooked (I got very sick with parasites as well as several others). There was no emergency medical care available on-site or emergency contact among the staff. For example, one volunteer got stung several times in the middle of the night by a scorpion and I had to administer aid and medication several hours later after she fainted in the volunteer center and no one knew what to do with her. I was told by a volunteer coordinator that because I was only staying for 2 weeks, I couldn’t expect to learn anything about the animals during that time. Sound terrible? It really was. And that doesn’t even get into the horrible rash that every single volunteer was covered with on their arms, necks, stomachs, etc. (which didn’t fully subside until 3 weeks after returning home). The facility didn’t care about the rash, didn’t offer medical treatment or antihistamine, just passed it off as “something that must be floating around in the air.” No gloves were offered or long sleeves, volunteers just had to work through it completely miserable and covered in blisters. I was informed by TripAdvisor that they only accept reviews from “visitors” (ie: day visitors) to a facility. If you are there for any length of time or in a volunteer capacity, you are considered an employee under their policy and your feedback will be immediately removed if they find it. Of course TripAdvisor only finds it if the facility you’re writing a review about flags the post for removal. Because no business will flag a positive review for removal, you see how then negative reviews are never seen because they are the only ones flagged, and subsequently removed. Definitely a very valuable lesson learned. 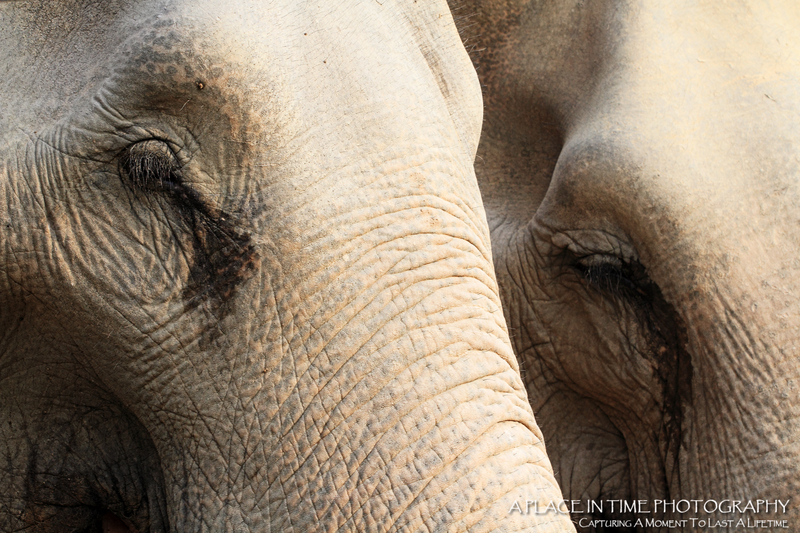 This photo was taken of two elephants who were housed together in one of the small pens. For nearly two weeks, I never saw any of their elephants playing or joyful. Not once. That’s not to say it doesn’t ever happen, I just personally never saw it. Which is a stark contrast to my previous experience at the Elephant Nature Park where the animals are allowed to live in a herd, or in sub groups as they wish, and roam freely through the river and grasslands during the day. This photo along with many other taken at this facility speak for themselves. The animals emotions and sadness was evident. While we worked tirelessly to feed and water them and clean their enclosures, emotional needs were definitely not being met. And with 500+ animals at once facility there’s really no way they could be. Some of the animals clearly craved human attention and cried and begged for it, yet it was strictly forbidden. Not even staff was allowed to interact. This was such a strange concept for me to try to wrap my mind around. Once these wild animals were rescued or surrendered from their human caretakers, they’re then brought to a sanctuary where they are no longer allowed any human interaction anymore. It’s hard to make sense of how this is remotely productive. While I agree wild animals shouldn’t be kept as pets, once that change has taken place and they are brought into a domestic situation, it seems cruel and pointless to then remove them from that bond all together and permanently. These are not animals who are being prepared for release into the wild, these are animals that will spend the rest of their lives in captivity through no fault of their own. Naturally some of them have the possibility of being dangerous and should be treated accordingly, but definitely not all of them and the policy was applied consistently across the board. It has taken me a long time to give any kind of public recount of my time at this facility because it was such a huge disappointment and none of us came out of the situation feeling like we made a positive impact at all. But that said, I did learn how differently sanctuaries can be run, the validity or lack thereof to TripAdvisor reviews, and brought to question human interaction with domesticated wildlife. And I captured images that I believe are some of my most powerful to date. Sometimes the silver lining is barely visible, but if you look hard enough you’re bound to find it hidden in there somewhere.